Merry Christmas everyone! Or Yule, as we say in Sweden. Before I go off to celebrate with my family I wanted to give a little sneak peak of what’s in store for Patreon this December. The art for the Night UI will be available for all eligible patrons that pledged before the 31st December. If you are new to Patreon: it’s a subscription service for NEW art I do every month. Patrons pledge at any day of the month; at the last day of the month Patreon withdraw the money and when all pledges have been processed, I send out the rewards to eligible patrons. I haven’t been idle while the blog went down! When Misty Teahouse was in limbo, I decided to write a little about Mistweaver legendaries. Mostly about how they work, since it isn’t always obvious by just reading the description. The page is sub-item to “Mistweaver Guide”, so you’ll find it listed there too. I’ve added more detailed descriptions of what the legendaries do, but since I haven’t been able to test all, I had to do some research on the legendaries that I do not own. Hopefully everything’s accurate, otherwise I’ll update it as needed. If you have tried to access my blog the past three days, you might have noticed that my blog was nowhere to be found. Through a series of unfortunate events, the Misty Teahouse took a trip to the dark side of the internet. Thankfully, I got it back in one piece through my vast powers of technology… I’m kidding, I called tech-support. Long story short, a less than a year ago I switched my blog through self-hosted instead of WordPress premium. The subscription for the premium ran out three days ago, which would have been all fine and dandy unless my domain had been part of that otherwise useless package deal. So yes, the domain was deleted, I called support and instead of paying for the whole premium package, I payed only for the domain and they fished it back from techno-limbo. Happy ending! Rising Sun Kick costs 2% of base mana, down from 2.3%. Crackling Jade Lightning now deals 140% of attack power damage, up from 70%. Mistwalk (Talent) now heals for 420% of spell power, up from 350%. Song of Chi-Ji (Talent) now has a 15 sec cooldown, down from 30 sec. Zen Pulse (Talent) now heals and deals damage for 220% of spell power, up from 200%. Dampen Harm (Talent) now reduces the damage of incoming attacks by 20-50% (depending on how hard attack) for 10 sec. Previously reduced the next three incoming attacks by 30% if they damage 15% of your health or more. Diffuse Magic (Talent) now has a 1.5 min cooldown, down from 2 min cooldown. Ring of Peace (Talent) now forms at target location and ejects all enemies out of the ring. Previously formed around a friendly target and knocked back enemies who used harmful spells or abilities. Healing Sphere (PvP) now has a 15 sec recharge time, down from 45 sec. Way of the Crane (PvP) now also make you immune to stun effects. I’ve been in a bit of a funk the past weeks. Long story short, I was a bit blue but now I’ve decided to pull myself up by the bootstraps and do things I’ve procrastinated. Step one, update as many blog pages as I can manage between work hours. The Elvui page is quite easy, so I’ve started with that. There’s only one profile so far (the old ones were completely outdated). But I’ve added a few more steps and addons to tweak the UI, so it’s a bit more elaborate than before. The guide takes you through each step, so don’t worry if you’re not too familiar with the addons. I’ll probably add a few more color variations at some point, and maybe a few more textures. But for now, this steel-grey profile works quite elegantly for all classes, if you prefer a more minimalistic style. The art of the Fall UI has been distributed to all patrons that supported me this November! Here’s a post to help you make that beautiful art into a functional UI. 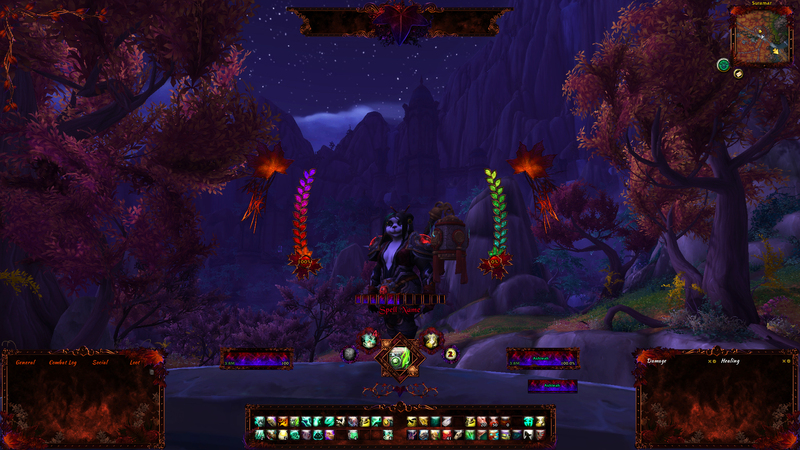 There’s an elvui profile and weakaura export strings ready to be imported to get the exact set-up I have. But don’t be afraid to experiment and make your own twist!